Tourists may face commute delays. Cuts for locals more severe. When Rio de Janeiro won the rights in 2009 to host the Olympics, Brazil planned a blitz of projects to showcase just how far it had risen. But when tourists start showing up in two months to attend the games, it’ll be the bust and not Brazil’s best that’ll be on display. That sewage-filled harbor that visitors will pass on the way from the airport -- and the spot where Olympic sailing events will be staged -- was supposed to be a shimmering, clean bay. That new metro line they’ll take from the posh Ipanema beach neighborhood to the games will at best run on a limited schedule, having started operations just four days before the opening ceremony. And what about the state-of-the-art gear that police were supposed to get to help keep travelers safe? A top official says it never happened. 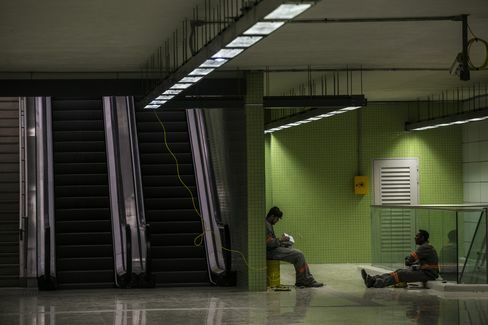 Workers sit beside escalators at the Nossa Senhora da Paz metro station in Rio de Janeiro. Welcome to Brazil, a land of political, economic and fiscal crisis. To be fair, most of the 39 billion reais ($11 billion) in arenas and infrastructure being built ahead of the Olympics will be ready in time and, besides a few eyesores and commuting delays, most tourists may not even notice all that should have been. But the unfinished work is an indication of a much bigger problem that will last long after the visitors jet out: Rio state is all but broke. 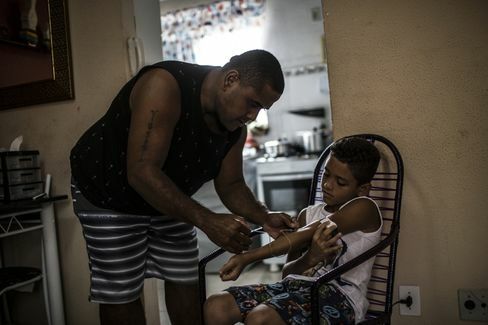 Rodrigo Batista da Silva administers state-issued medicine to his 9-year-old son. No one knows that better than Joao Vitor da Silva and his father, Rodrigo da Silva. The scrawny nine-year-old in an Iron Man T-shirt is a hemophiliac, and Batista said they’ve been warned that public-health spending cuts may disrupt supplies of prophylaxis, the shots that prevent Joao from bleeding out whenever he’s injured or sick. “If there’s money for the Olympics, there has to be money for health,” said Da Silva, a 34-year-old former forklift-operator who’s on medical leave. Brazil’s hardly the first nation to host the Olympics games from a hotbed of chaos. (Russia, Mexico and South Korea are all part of the club.) Even so, the tumultuous backdrop when the games begin Aug. 5 is a far cry from the image of the up-and-coming powerhouse organizers had envisioned when hosting rights were awarded. These days, Brazil is stuck in a crushing recession and Lula’s successor, Dilma Rousseff, was stripped of power while she faces an impeachment trial on allegations she illegally financed budget deficits. Rio state missed debt payments last month and is delaying public-worker salaries after oil prices collapsed, a primary source of revenue. And at least six companies contracted for Olympic projects and related infrastructure have been crippled by allegations they paid kickbacks to win lucrative public-works deals. Mangrove trees at the border of Guanabara Bay. 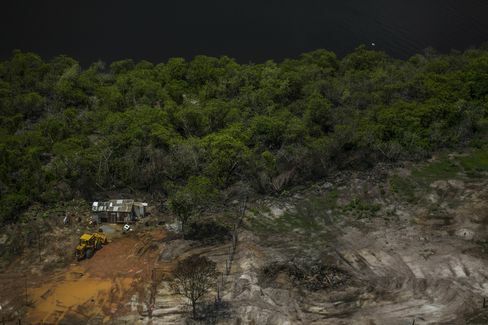 Three of those companies -- builders Queiroz Galvao SA, OAS SA, and Andrade Gutierrez SA -- were responsible for a project to dredge four polluted lagoons and plant 500,000 mangrove trees in Barra da Tijuca, the key staging ground for the games. But work won’t be ready after public prosecutors requested delays and then the state faced cash shortages, according to the Environment Secretariat. A press official for the builders group confirmed that the pace of work has been “reduced” and declined to comment further. “Rio is the showcase of Brazil -- of its incompetence and impunity,” said Mario Moscatelli, the biologist subcontracted by the construction firms to plant the mangroves. He says he’ll be able to finish less than 10 percent of the work. Queiroz is also part of the group building the subway line from Ipanema to Barra, which still awaits a nearly 1 billion-real loan from the Rio-based national development bank before it can finish works. Rio state projects a 20 billion-real deficit this year, of which 12 billion relate to the underwater pension system, and Thursday announced a new round of spending cuts. Almost 70 percent of public-school teachers and workers have been on strike since March as salaries are delayed, their union says. Rio city was forced to take control of two public hospitals, and a doctors’ group warns others may soon close for lack of funding. The state also slashed its security budget by 32 percent this year and has delayed payments to police and their families. New equipment police expected for the games never materialized, and instead many officers are saddled with obsolete gear, said a high-ranking military police official, who asked not to be identified criticizing the budget cuts. All major security investments for the Olympics have been carried out since 2012 or are in their final phase, and any personnel or equipment shortage during the games will be covered by federal security agencies, according to the press office of Rio’s security secretariat. Claim faucet bitcoins over at Easy Bitcoin Faucet. Up to 33 satoshis every 10 minutes.